• Increased the number of riders accommodated to 115a 44% increase in one short year. • Added an instructor, enabling us to reach more clients. • Sponsored and ran a 4-day Hippotherapy Workshop, led by Myriam Rehle, an internationally renowned hippotherapy specialist from Germany. This was a national workshop to train instructors and therapists in the therapeutic use of the horse. • Operated a special 5-week Winter Program for the Visually Impaired. A number of these new riders have joined our regular program. • Began our first Summer Camp, two two-week sessions which utilized able-bodied youth as counselors for peers facing greater challenges. It was a big success. • Expanded a Volunteer Enrichment Program. • Ran our first Annual Ride-A-Thon from our own facility. • Fielded a very successful Horse Show, where our riders proudly showed a crowd of family and friends their achievements. We were as proud of them as they were of themselves! Our wonderful new facility and the continual efforts of our 200 loyal volunteers have afforded us these new program opportunities. The Center and these additional, creative programs bring a heavier financial responsibility. Our diligent Board of Directors (many of whom are active volunteers) has focused on the completion of our building and land phase of the Capital Fund Campaign, which is planned for completion on June 30, 1992. If we could pay for the land and retire our mortgage debt, the funds from our generous members, community sponsors, corporations and foundations could be utilized primarily for our riders, removing those on our waiting list who are eager to become High Hopes riders. We could also i!1crease our innovative offerings, fine-tune our training of volunteers and instructors, and become a national name in therapeutic riding. Each and every one of you has earned my sincere gratitude for your part in the growth and success of High Hopes. Your dedication to civic responsibility is even more vital in these troubled economic times than ever before. Your time, talent and financial support mean everything to our present-and future-riders. 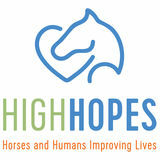 We have "High Hopes" that your continued loyal support of our fundraising efforts will be stronger than ever. 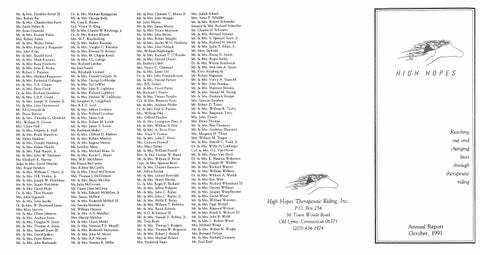 Listed below are those who contributed an Annual Membership Gift or a Capital Campaign Gift to High Hopes from July I 1990 to June 30, 1991. We are extremely grateful for these gifts A special vote of thanks to those who supported our Horse Sho\l and other events during the year or gave needed "gifts in kind.' To all who care about High Hopes in so many ways we extend our heartfelt thanks.